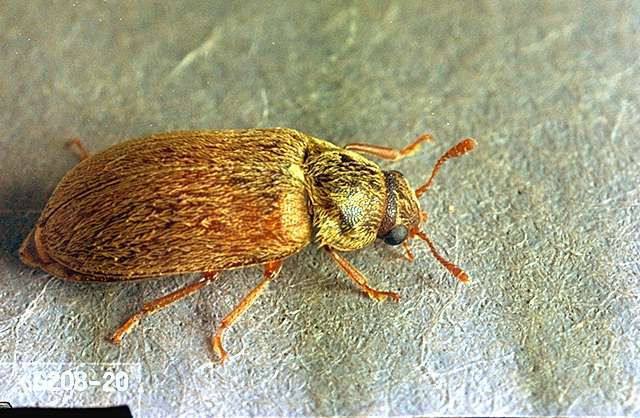 Pest description and crop damage The adult is a small yellowish brown beetle 4-5 mm long. 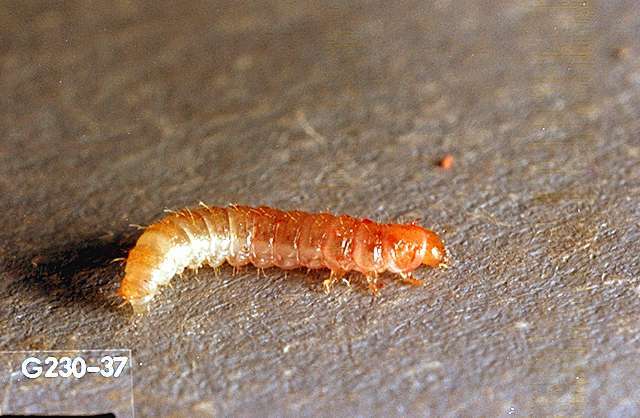 The larvae are 8 mm long; white with brown areas on the back of each segment. Adults feed on fruit buds and unfolding leaves. This injury can be serious in the spring. After the flowers open, the beetle feeds on the stamens and pistils. Injured blossoms often turn into distorted berries. 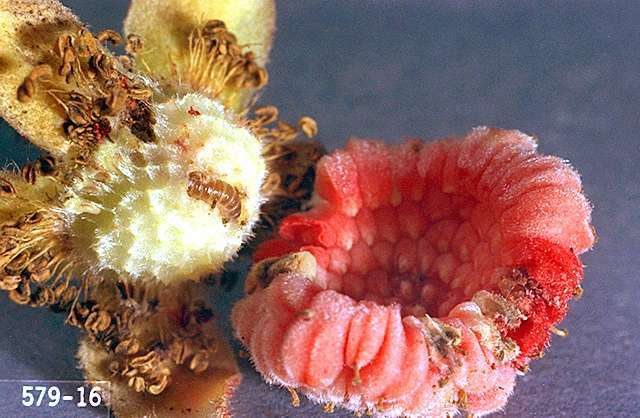 The larvae enter the young blossoms or fruit and feed on the receptacle. The larvae often remain in the fruit at harvest, and represent a significant contaminant in harvested fruit. Biology and life history Adult beetles overwinter in the soil, emerging in late April or May to feed on new leaves, blossoms, and berries and to lay eggs. 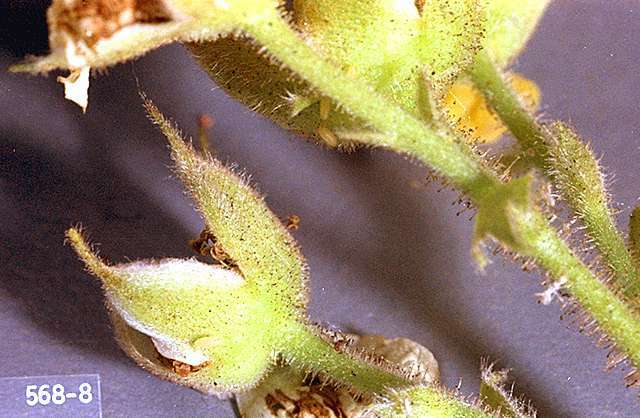 Eggs are fastened to the flower buds or stems of the plant. The emerging larvae work their way to the center of the fruit. They feed on the fruit for 30 days or more, and then drop to the ground to pupate in the top 3 inches of soil. There is one generation per year. Scouting and thresholds Adults are difficult to see (a hand lens may help) but can be observed by careful inspection of new leaves in spring and young blossoms. The adults feeding on unfolding leaves make characteristic slits by eating the interveinal areas of the leaf. carbaryl (Sevin and other brands) at 1 to 2 lb ai/a. PHI 7 days. diazinon (several brands) at 1 lb ai/a. PHI 7 days. Apply prior to bloom. One application per season allowed; as such, consider other pests that may need to be managed with diazinon. Restricted use pesticide. spinetoram (Delegate WG) at 0.05 to 0.09 lb ai/a. PHI 1 day. Toxic to bees for three hours following treatment. Do not apply when bees are foraging. spinosad (Success or Entrust) at 0.062 to 0.1 lb ai/a. PHI 1 day. Toxic to bees for three hours following treatment. Do not apply when bees are foraging. Entrust is OMRI-listed for organic use.